Join The Frosted Button before October 23 for a chance a gorgeouse double-strand bracelet from RockStone Treasures! 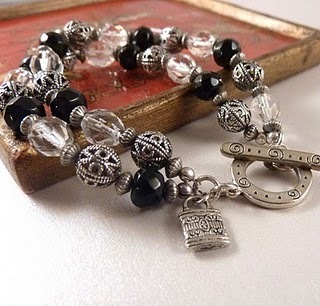 It has a black and clear Czech glass beads with detailed silver filigree round in between. Finished with a silver toggle clasp, dangling off the bracelet is a small silver handbag charm.